'These slotted spatulas are ideal for flipping eggs, pancakes or vegetables in a pan. 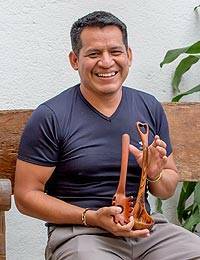 Since they are carved from wood, they won't scratch your pans,' Peten Wood Artisan Sculptors tell us with obvious pride. They carve the spatulas by hand from manchiche wood, a Guatemalan hardwood that is burnished red by nature, with the grain forming myriad patterns.